After using the Pebble for a few days, I realized that I was daydreaming about it: I wanted it to do more. That’s unusual — I rarely trust new products to work correctly, especially new products from unproven companies. But the Pebble’s charming simplicity and fundamental competence inspires confidence. It’s so good at what it does now that it’s easy to imagine all other things it might do in the future. There’s no reason it can’t replace a Fitbit or Nike Fuelband, for example, and I’d love to be able to send replies to emails and text directly from the device. 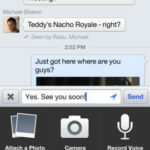 And Pebble’s promised app support means we’ll eventually see even more uses for it. 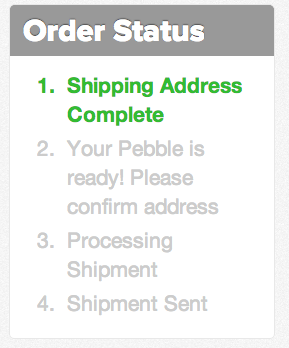 Our Pebble order has not shipped yet. Users can check the status of their order by logging into their account on the watch’s website. The Pebble is one of the most anticipated third party accessories for the iPhone, as shown by the demand shown on its Kickstarter campaign which hit 85,000 orders and over $10 million dollars raised. 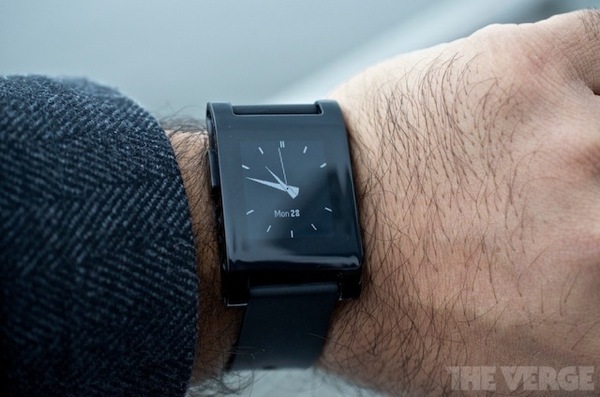 Are you waiting for your Pebble to arrive?